So, what thoughts and images does a name conjure up? Mention a name or even the question; ‘Who was Richard III?’ for instance; the response may be something like ‘Oh yes, the wicked uncle who did away with his nephews in the tower’; Winston Churchill; ‘He won us the Second World War’; JFK; ‘Shot in the head in Dallas’; Anne Boleyn; ‘Henry VIII chopped her head off’!!! And thus, we nearly always have some kind of response; the more enlightened of us know there is no ‘simple’ answer to those questions. And, although we each have our own personal viewpoint, the fact is, most of us will have some idea of who these people were, even if they know nothing more than the very briefest of detail. The name, Anne Boleyn. Just who was she, and why it is that even today, some 475 years after her horrible death, people are able to answer that question, even if it is a somewhat limited response. 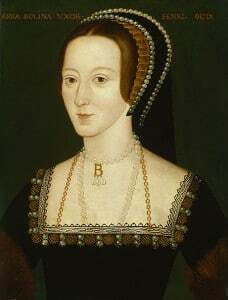 The simple answer is that Anne Boleyn, though dying at a comparatively young age, has managed to live on, in the hearts and minds of people down the years. But perhaps more importantly, she has also been, to some degree, hidden deep inside the English psyche, as a person to whom we, as a people feel was for want of a better word, ‘framed’ and most despicably dealt with by the laws of her period and her name still evokes a reaction even in today’s so called liberal society. Anne, I feel, has managed to make an impact on history, simply because she was someone who was and is, that little bit too close for comfort to our own wants, needs and desires and, in so being we can relate to each and every move she made though it were ourselves, but given the security of time and distance. We have the luxury of being spectators at a life played out on the historical stage, with each of the actors playing their parts adeptly. We can visit the different scene sets, where the acts take place, Hever Castle, Hampton Court, The Tower, Westminster etc. We can imagine the Boleyn family, at supper, at prayer and in conference with ‘Uncle Norfolk’. We can even go the places in France, where the young Anne learned how to conduct herself and become skilled at Court etiquette. Although we can never be sure of Henry’s thoughts and feelings throughout those short weeks around the end of June/beginning of May 1536, we do know that both his Counsel and his Clergy were working overtime to find a solution to the ‘heir’ issue and, many would say, a way to remove the overly ambitious Boleyn faction at court. Eventually the only way that presented itself to them, was to literally remove the head from the body and in doing so, the adjoining sections would be left to wither away. However much Anne had wanted to be Queen of England, one has to remember that the whole was bigger than the one, and Anne was the forfeit made in order to remove both issues of heir and over mighty subjects in one fell swoop. To eradicate a living Queen from the throne of England, regardless of how she had made her way there, now became a precedent for future generations. It also provided that no one subject was greater than either the King and, certainly at the time in question, his immediate Counsel, Master Secretary, Cromwell. Although there were further horrendous acts played out, both in Henry’s future and in the years following his rule i.e. Mary, Queen of Scots, no one Queen has been spoken of more and has divided opinion, than Anne Boleyn. Why Anne Boleyn and why not Catherine Howard? Simply because, these two Queens though related, were poles apart when you begin to look deeper into their personalities and characteristics. Anne, when the time came, could see her chance at the glittering prize, i.e. becoming Queen and she knew how to reel in Henry, until the day came when she obtained that for which she had striven so long to achieve. Whereas Catherine, though educated and from a grand background, was merely used as a pawn and a tool for her own family’s ambitions. It was unfortunate that Catherine was not given better guidance from her family and I feel her naivety led to her sad and untimely downfall. Catherine Howard was manoeuvred into playing a part for which she was not clever enough to have read the script! And so to realise what impact Anne’s life and death had on history, we really only need to look at ourselves and our own nature. Anne played the game of life with its ultimate prize and lost. We can look at her case through the safety of time having passed by, but really the answer to the question; did she make an impact on history, then the answer is certainly; yes she did. Why? Because Anne Boleyn was and still is a person we can all relate to, from the lurch in our stomach we feel when her final scene is played out on TV or cinema screen, to our disbelief in man’s merciless and brutal actions to another human being. It is still the case that one woman’s life and death many years ago can still make us reflect on who and what we are today.